Officer George S. Nagata Jr., a 33-year veteran of the Los Angeles Police Department, died on May 3 after falling ill while on duty and being hospitalized. He was 62. Born on Sept. 20, 1951, in Santa Monica, Nagata was appointed to the LAPD on Jan. 26, 1981. He was last assigned to the Central Area. He is survived by his domestic partner, Rosie; son, David; daughter, Kelly; sister, Loretta; and nine grandchildren, according to the LAPD. • The public may contact the credit union to make a donation or can mail in donations. 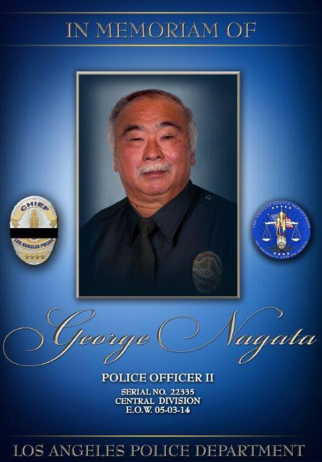 Checks must be made payable to “Blue Ribbon Trust for George Nagata” and sent to: Los Angeles Police Federal Credit Union, Attn: Blue Ribbon Trust for George Nagata. P.O. Box 10188, Van Nuys, CA 91410. • You may also visit www.lapfcu.org and obtain additional information online from the Community Corner. For additional information, contact LAPFCU Vice President of Marketing Manny Padilla Jr. at (818) 779-3311. At a May 6 Police Commission meeting, Chief Charlie Beck said it was a very sad weekend for the department with the loss of Nagata and Officer Roberto Sanchez, who was killed in a traffic collision while on duty in the Harbor Area. Beck said the services for Nagata will be on Tuesday, May 13, and the funeral for Sanchez will be Wednesday, May 14. Nagata’s service will start at 9 a.m. at St. Basil Catholic Church, 3611 Wilshire Blvd. in Koreatown. Five LAPD officers have died so far this year, four of them in traffic collisions. “This is a difficult time for our men and women in blue, and the whole city joins them in mourning the loss of these heroes,” Mayor Eric Garcetti said.